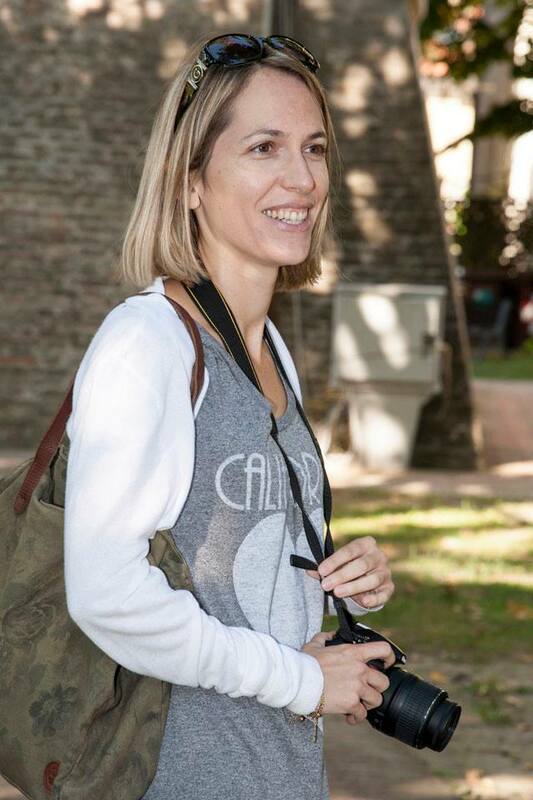 I’m a licensed tour guide (specialization: hiking/environment) and I offer guided walking and hiking tours in Bologna and Emilia-Romagna (both private and group tours). My tours are in the hills, in the countryside and in the Apennine mountains, and may include food and wine tastings. We’ll walk up the Portico di San Luca, a landmark monument of Bologna, the longest covered walkway in the world, built in the 17th century with funds from Bologna’s citizenry who wanted a portico that would shelter the Madonna di San Luca icon during its annual descent into the city. The Portico di San Luca is a beloved walk for the Bolognesi, and porticos are a remarkable architectural feature of Bologna, which boasts 38 km of them, currently inserted in the Tentative List of Unesco’s World Heritage sites. During the tour, you’ll learn about both the history of San Luca and why Bologna is the city of porticoes. When we get to the top, I’ll take you to a fantastic photo op of the Basilica di San Luca. We’ll descend back into the city via a historic pilgrim’s path, to reach Casalecchio, where we’ll catch the bus back to Bologna, stopping along the way to eat gelato at one of the most popular gelateria in town. Duration of tour: approximately 3.5 hours. Cost: €160 1-4 pax, €200 5-8 pax. Includes gelato, does not include bus ticket. For experienced walkers interested in taking a longer walk, I offer the option to do a loop that would take us around the hills of San Luca. We’ll walk up through a park that offers ever enchanting views of the Basilica di San Luca, the portico and the city of Bologna, then reach the Sanctuary and descend via the famous Portico di San Luca. This longer variant is approximately 10 km (6.2 miles). Duration of tour: approximately 4 hours. Cost: €165. To the immediate south of Bologna’s city center begins a hilly landscape that will surprise you for its beautiful views and peaceful atmosphere. From the gardens of an 18th century villa, we’ll walk up to reach a park where we’ll enjoy panoramic vistas of Bologna, the surrounding hills, and a unique perspective on the famous Portico and Basilica di San Luca. Surrounded by these views, we’ll delight in a picnic/aperitivo Emilia-Romagna style, tasting such local delicacies as mortadella, Parmigiano Reggiano, Prosciutto di Parma, crescenta bread, accompanied by a glass of Pignoletto wine, and make a toast to your Bologna trip! Price: €130 + €20 per person for the tastings. Max 8 people. 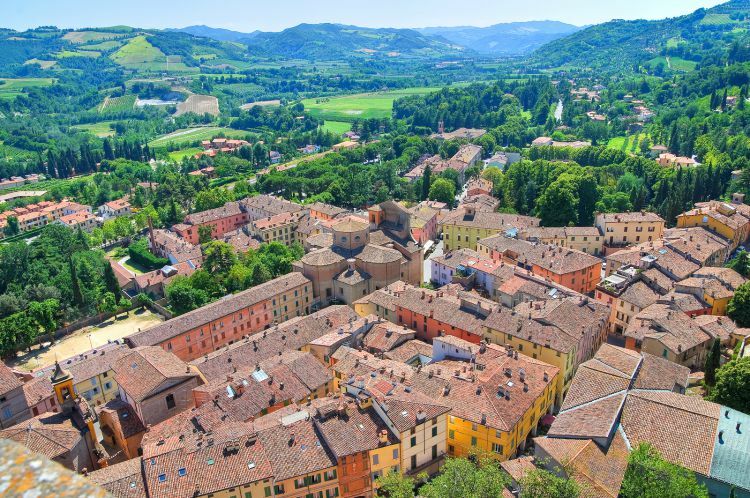 We’ll head to the Valley of Samoggia, approximately 40 minutes from Bologna, where we’ll visit a medieval borgo (village) on top of a hill which we’ll reach on foot (approx. two-hour walk, low elevation gain). Then we’ll go visit an agriturismo run by a young woman who has restored her grandparents’ house at risk of crumbling and turned it into a farm, where she now makes wine, honey, grows vegetables and runs a ‘locanda’, cooking seasonal, local, organic food. We’ll tour the farm and have a typical lunch there. The agriturismo is in a lovely spot, with great views of the hilly countryside that surrounds Bologna. After our leisurely lunch, we’ll visit a medieval village that was once a strategic outpost in the battles between Bologna and Modena, and is now in the heart of production of Pignoletto, the typical wine of the Bologna hills. Transportation is additional, if you don’t have a rental car, please contact me for options. For details about the tours and for pricing, please contact me: bolognauncovered@gmail.com. *I also regularly offer these tours for groups (max 8 people), they’re a great option for those traveling on a budget, follow my Facebook page for the scoop on dates. I offer one-hour travel consulting sessions via Skype or FaceTime to help you plan your trip in Bologna and around Emilia-Romagna. It can be overwhelming and time-consuming to navigate and select all the information that is available online; wouldn’t it be great to have your trip mapped out in an hour? Where is this beautiful village? I can help you discover this and more off the radar places when you book a travel consulting session with me. – I’m a local – born and raised in Bologna! I can tell you not just about the must-see sights, but also about little-known gems away from the tourist circuit. – I love traveling and keep exploring my region regularly so I can share my latest discoveries with you. – I have experience in the travel industry, having worked as a travel consultant for a U.S. tour operator, Visit Italy Tours, where I planned trips to Italy for American travelers. – I share tips on places to see, stay and eat I’ve personally experienced and enjoyed. – I love talking about my region! And I love it even more when travelers enjoy their visit to Bologna & Emilia-Romagna. When you contact me, please give me an idea of what you’re most interested in seeing/doing so we can make the most of our chat time. Cost of 1-hour travel consulting session: €75, payable via Pay Pal. If you’d like to book a travel consulting session with me, please write me at bolognauncovered@gmail.com. Heading to Bologna next week (June 23-28). Will be interested in tour. Not sure of our schedule yet. Will contact you when things more definite.